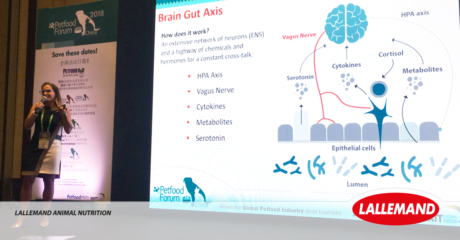 At the Petfood Forum China, in Shangai, Francesca Susca, Ph.D., DVM, Pet Development Manager at Lallemand Animal Nutrition, shared some new insights into brain-gut-microbiota interactions in pets with a lecture titled: From the gut to the brain, and back: A two-way connection for improving pet well-being. The Brain-Gut axis and current understanding of how it works. Shaping the intestinal microbiota could be a way to optimize pets’ overall health and, consequently, improve pets’ well-being. The brain-gut axis is a well demonstrated concept in humans, showing that the enteric microbiota communicates with nervous, emotional and cognitive systems. The lecture highlighted recent research focusing on the brain-gut axis and the capacity of specific natural microbial solutions to enhance pets’ well-being. In particular, the potential of probiotics to influence the brain-gut axis is a growing field of evidence with first animal study published in 20061, briefly followed by the first human studies showing that a probiotic supplement can effectively alleviate both physiological2 and psychological3 symptoms of chronic stress. To date, more than 50 published studies have evaluated the link between probiotics supplementation and the brain-gut axis. The brain-gut axis represents certainly one of the newest and most promising areas of research in microbiota and probiotics. The studies presented in Shangai pave the way for new holistic approaches to modern pet well-being issues by targeting the gut microbiota. For more information about Lallemand’s portfolio of microbial-based solutions for pet nutrition, contact us or visit https://lallemandanimalnutrition.com/en/europe/our-products/pet-nutrition/. Zareie, M., et al. (2006). “Probiotics prevent bacterial translocation and improve intestinal barrier function in rats following chronic psychological stress.” Gut 55(11): 1553-1560. Messaoudi, M., et al. (2010). “Assessment of psychotropic-like properties of a probiotic formulation (Lactobacillus helveticus R0052 and Bifidobacterium longum R0175) in rats and human subjects.” Br J Nutr 105(5): 755-764.